These are the excellent presentations from the Children with Cancer UK sponsored childhood cancer session organised by Professor Denis Henshaw for the 8th Princess Chulabhorn International Scientific Congress held in Thailand in November 2016. Our highly successful 2017 conference concentrated on the latest in advanced treatments research. 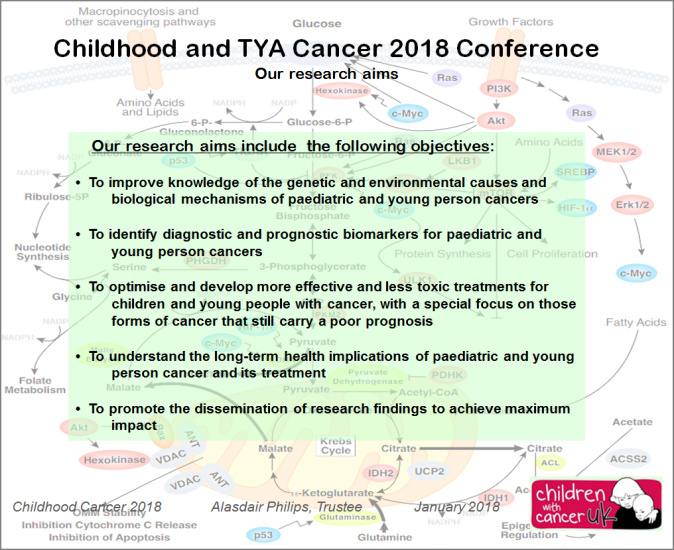 Our 2018 Conference primarily concentrated on causal factors and prevention but also had updates on our current treatment projects and some other non-standard forms of treatment. A systematic study of cancer drugs approved by the European Medicines Agency in recent years found that most had no evidence of better survival or quality of life (doi:10.1136/bmj.j4530). "The few drugs with evidence of benefit achieved only marginal gains." The percentage of children and young people with cancer who survive more than ten years has increased little since 2000, and those who do survive often have considerable personal health and life challenges. It is clear that we need to develop improved approaches and integrate changes that have been shown to help. This challenging conference explored evidence-based possibilities for change. Childhood cancer; do we have enough evidence to act now for prevention? The multi-causal nature of Cancer and the IARC Monograph assessments. Plenary workshop session - what are the key issues we need to address? 11:50 Associate Professor Marco Vinceti - Ramazzini Fellow Director of CREAGEN, Modena, Italy. Electric light can disrupt circadian rhythms in children: is that a problem? 13:00 Lunch - PLEASE take down and remove all Posters by end of lunchtime! 15:50 What have we learned so far?